A large portion of Guatemala coffee comes from the famous growing region of Antigua that yields some of the world's finest coffee. 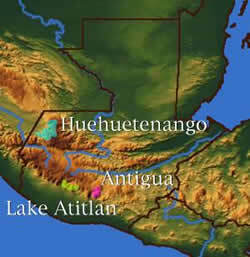 Some excellent examples also come from Huehuetenango and Lake Atitlan. 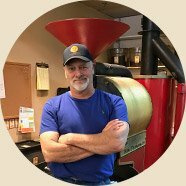 A genuine Antigua is full bodied, rich in flavor, and offers an intense, smoky, complex cup. Many experts rank the best Guatemalans second to none in terms of quality in the cup. Guatemalan coffees are some of the most amazing fragrant and aromatic coffees in the world. The natural shade and jungle of the Guatemalan highlands are the perfect environment for the bourbon botanical variety of arabica (a spontaneous variety of the original typical), which lends itself to a very nice and very natural full cup. Hue Hue Tenango (way way ten-na-go) in the northeast frontier produces a wonderful bright coffee with nice body, and excellent floral tones and fruitiness. Besides all these great cup attributes, it's a fun one to say, "Way Way." Coffees from around Lake Attilan are a classic Guatemalan cup. Atitlan's are coffees with deep body, stunning acidity and fruit, and hints (more than mild suggestions) of chocolate and cinnamon. Atitlan's are truly a classic amazing cup. Antigua is Guatemala's oldest and most famous coffee growing region. The magnificent volcanoes of Agua, Acatenango, and Fuego enclose this valley. Fuego lives up to its name (fuego means fire in Spanish) by spewing forth volcanic ash continuing to add to the rich soil of the area. Antiguan cups are nice bodies, full-on bright coffees with spice. There is a reason this region is so loved and sought out by the coffee connoisseur. All in all, Guatemala must be a stop on your coffee journey. Cup Profile High acidity, clean, with fruit.